Are you ready to rock?! 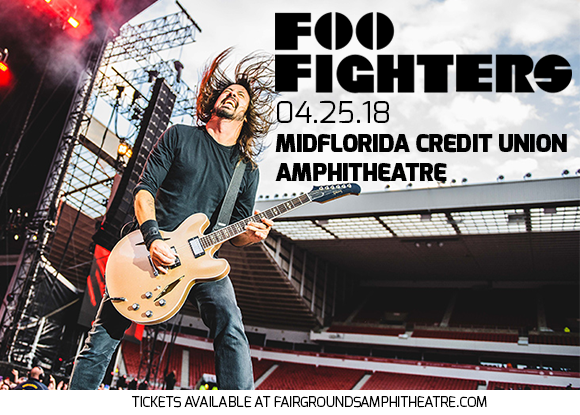 Then you’re in the right place – the Foo Fighters are on tour again, coming to MidFlorida Credit Union Amphitheatre on Wednesday 25th April 2018 with their fresh new album, “Concrete and Gold”!! This is guaranteed to be a sell out show so be QUICK on that “Buy Tickets,” button! Since forming the Foo Fighters in 1994, Dave Grohl (originally the drummer for legendary grunge band Nirvana and involved with the stoner rock act Queens Of The Stone Age) has led his creation to a point of phenomenal success and longevity. “Concrete and Gold,” is the band’s ninth album and their most recent release since 2014. Be among the first to hear all the new songs live! What are you waiting for?? Hurry and get your tickets to see the Foo Fighters live NOW while they last! !